Taken during the Sharjah Light Festival which was ongoing the time I was in the UAE. 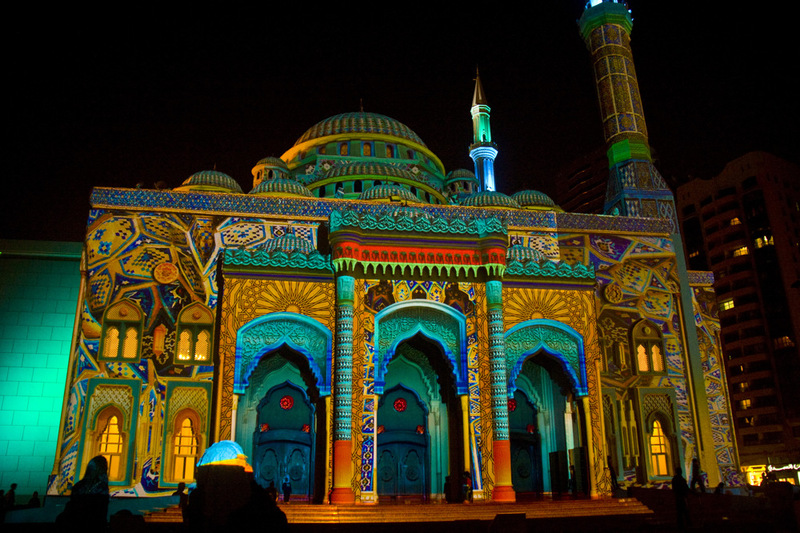 The installations, which included such mosques, a few marge squares and inflatable displays, were located around the Sharjah Lagoon and made an vening stroll quite lively and enjoyable. I am not entirely sure, but this could be the Al Noor Masjid. It is a very impressive light display, Ayush...was there sound, too? Amazing colors Ayush! Well captured! It's an unbelievable sight, Ayush. I bet it seems almost blah during the day?! There is not much you could add to brighten this up a bit Ayush. If its all like this, it must be fabulous. The colours are amazing. What vivid colours. It would be a treat to watch light shows while you were strolling in an evening. This invites you to pick up the camera. Certainly a great range of colours there. Most impressive with these vivid colours Ayush! stunning colours ayush! I would love to see something like this for myself. Almost too much but a great view. I think this place is alive 24 hours a day. Wonderful patterns and stunning colours. Holy moly, Ayush, you almost need sunglasses to look at this. What an amazing array of saturated colours. Fantastic! Wow - not exactly subtle colours!